This suspenseful masterpiece begins when the mysterious Inspector Goole calls unexpectedly on the prosperous Birling home, shattering their peaceful family dinner party with his investigation into the death of a young woman. Revelations shake the foundations of the family's lives, prompting an examination of their consciences. "...Most striking though in this revival - which features uniformly stellar, generous ensemble acting from Liam Brennan, Christine Kavanagh, Jeff Harmer, Andrew Macklin, Lianne Harvey, Hamish Riddle and Diana Payne-Myers - is how intensely it reminds you that today's debates about the obligations, efficacy and morality of those who control capital hardly are new." "...Aside from the very fine performances - especially Brennan and Harvey - what makes "An Inspector Calls" truly exceptional is its full-force theatrical display. It's the set (Ian MacNeil), the lighting (Rick Fisher), the music (Stephen Warbeck), the costumes (MacNeil), and the way Daldry sweeps them up into his stunningly original vision. It's unlikely that the play will change many hearts or minds with regards to its politics (few plays do) but it's overwhelmingly potent artistry inspires a great deal of wonder. It will leave audiences awestruck, with a slight emphasis on the "struck."" "...So it's perplexing that director Stephen Daldry, known for his exquisite restraint on Netflix's The Crown, applies the nuance of a thermonuclear blast to Priestly's script. On Ian MacNeil's gorgeously overdetermined set, everything is metaphor writ large, from the Birling manse, barfed up from the earth and teetering on spindly metal girders, to the puddle of filth that will receive more than one Birling visitation." "...If you harbor any interest at all in stagecraft, put this one at the top of your must-see list. It is a masterpiece of ensemble acting wrapped in a brilliant concept. Priestley's noir thriller as morality tale has been around for seven decades, and was made into a film in 1954, but Stephen Daldry's laser-focused staging makes it feel deliciously fresh, newly and wickedly biting." 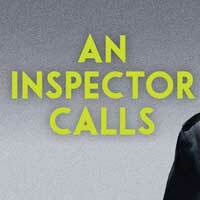 "...An Inspector Calls is a mystifying thrilling joyride from the first word. It's a suspenseful quest for truth with an ending that will have you thinking if Oscar Wilde 1889 essay "The Decay of Lying," was right about life imitates art." "..."An Inspector Calls" is a mystery and at times might be a bit confusing unless you pay close attention. You will not want to doze off, because if you miss one little bit, you may be lost forever. By the way, forever in this case is 100 minutes ( no intermission). The play is written by JB Priestly and is directed by Stephen Daldry. The set (Ian MacNeil) is unusual to say the least as the house we see is a miniature one indeed. When the people in the house come out for a cigar, they have to bend down to go thru the doorway. Do not let this bother you! Pay attention to the characters and what they are doing and saying as this is a mystery!" "...At the end of the day, this �Inspector� is best treated like any other exhibit you�d find at a museum: a quick glance, an introspective �hmm,� and on we go, with so much else to see." "...This production is a rare and wonderful treat. Chicago Shakespeare Theatre must be congratulated and heartily thanked for bringing this theatrical delight to the Windy City. Such a magnificent production of this thought-provoking drama would seldom be expected to be seen outside of Broadway or London�s West End. The spectral, supernatural production design, gorgeous costumes, intrepid performances and the haunting message that�s buried within this delectable period mystery, will reverberate long after the final curtain. Although referred to as a drawing room classic, Priestly�s best-known work is a superbly entertaining indictment of society�s hypercritical ways, presented with wit, taste and artistry by one of the world�s finest theatres. Do not miss this production!" "...It could be argued that the British revival constitutes two separate plays, Priestley's realistic original and Daldry's extravagant expressionistic revision. Many of the special effects, plus those silent figures on the fringe of the action, are intriguing to watch but aren't helpful in explicating the play's main themes. On the other hand, those themes are so black and white in presentation that Daldry's creative dose of special effects can't be challenged, at least on theatrical terms. Any way the viewer slices it, our British visitors have given local audiences a memorable 105 minutes." "...And even when the puzzle seems to be solved, it's not. What just happened? Or didn't happen? Director Stephen Daldry impressively orchestrates this surreal mystery. His terrific ensemble and design team leave us perplexed and entertained. " "...JB Piestley's classic "An Inspector Calls" has landed at Chicago Shakespeare Theater just shy of it 75th birthday. But its scenario is as interesting and suspenseful today as it was when first performed in 1945." "...AN INSPECTOR CALLS might not be the best fit for those looking for a comedy or a light-hearted show. It would be a good fit for anyone who loves a slow-building plot to a huge reveal at the end and for those who have an affinity for 20th century thrillers."